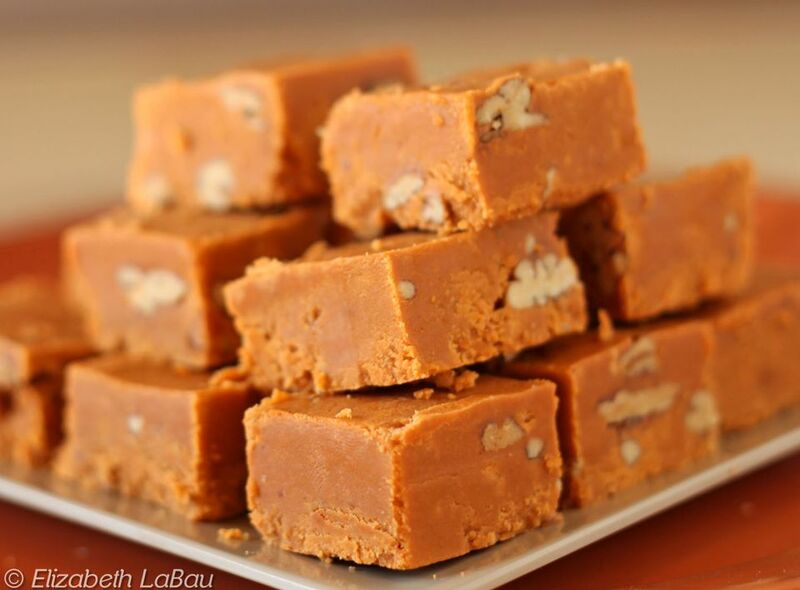 Sweet Potato Cinnamon Fudge uses sweet potato puree and cinnamon chips to give this smooth fudge recipe an irresistible fall flavor. This recipe is a great way to use up leftover sweet potatoes that have been roasted or used in a sweet casserole, but you could also substitute canned sweet potatoes or pumpkin puree. Cinnamon chips are often located in the baking aisle by the chocolate chips, but if you cannot find them, you can substitute white chocolate chips and a hefty spoonful of cinnamon for a similar flavor. Prepare a 9x13 pan by lining it with aluminum foil and spraying the foil with nonstick cooking spray. In a large saucepan over medium-high heat combine the sugar, butter, evaporated milk, salt, and sweet potato puree. Stir until the butter and sugar dissolves, then wipe down the sides of the saucepan with a wet pastry brush to prevent crystallization. Insert a candy thermometer. Continue to cook, stirring frequently, until the thermometer reads 234 degrees F/ 112 C (soft-ball stage). This boiling will take about 20 minutes. Once the fudge is at soft-ball stage, remove the saucepan from the heat and stir in the cinnamon chips until they're completely melted. Next, add the marshmallow cream and the chopped nuts, and stir until they're well-incorporated and there are no streaks of marshmallow cream to be seen. If desired, you can add a few drops of orange food coloring to boost the color of the fudge. Scrape the fudge into the prepared pan and allow it to set and cool completely at room temperature. Once set, use a large knife to cut the fudge into small squares to serve. Sweet Potato Cinnamon Fudge can be stored in an airtight container at room temperature for up to a week.